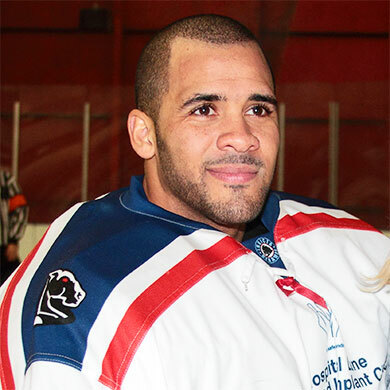 34 year old Chris Douglas signed for the Dynamos from the Bracknell Hornets last summer and was a revelation at the SilverBlades over the course of the campaign. In 38 appearances for the side he played some 2138 minutes and saved all but 116 of 1499 attempts on his net for a shot stopping rate of 92.26%. His goaltending helped the club secure previously elusive wins over the likes of the Wightlink Raiders and Chelmsford Chieftains whilst Douglas also recorded a shutout against the Essex outfit in the Southeast Trophy back in January. A dislocated shoulder then threatened to end his campaign in mid-February but the goalie, who initially attempted to return to the ice just minutes after his injury, battled back to feature for the Dynamos in the playoffs. His excellent displays saw him scoop the Supporters’ Player of the Year and Defenceman of the Year honours at the club’s end of season presentations whilst his efforts were also recognised by his peers – the rest of the NIHL South’s skaters voting him the league’s All-Star netminder. “Disco was phenomenal for us in 2013/14 and his excellent displays earned him the attention of clubs both in the NIHL and above so we are delighted he has opted to stay with us. He has formed an excellent relationship with the supporters in Kent and I’ve not doubt that this was a major factor in his decision to remain here. He’s all heart, is committed to the point that even a dislocated shoulder can’t keep him out of the game and he brings as much to the team off of the ice as he does on it and I look forward to working with him again in 2014/15”.